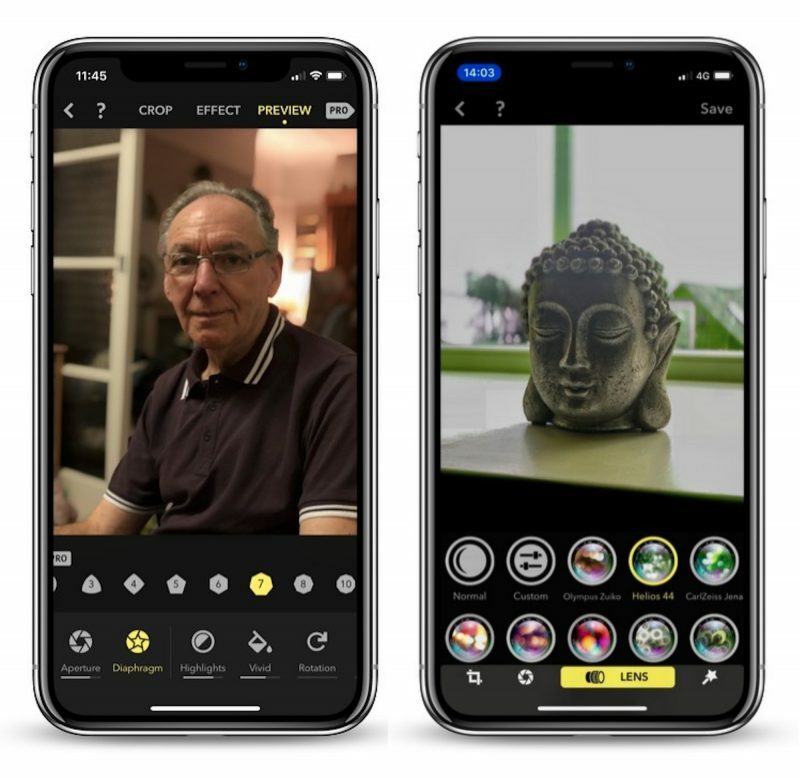 Portrait Mode photo editor Focos received an update today that should pique the interest of dual-lens camera iPhone owners. The app recently made our end-of-year best iOS app list for its impressive granular aperture and bokeh adjustment tools, but version 1.2 builds on the existing feature set by adding the ability to apply real lens optical effects to depth images. The update introduces a redesigned interface layout to accommodate the new preset lenses, which include Olympus Zuiko, Helios 44, CarlZeiss Jena, CarlZeiss Otus, Leica Noctilux, Minolta STF, Minolta RF250, A1, A2, A3, and A4. In addition to the above lenses, users can create custom presets for images with depth information by combining multiple lens settings and saving them under a recognizable name. Fotos' library of presets can also be re-organized for easy access from the editing menu. Elsewhere in this update, a tilt-shift effect has been added to the app's range of filters, offering users another level of control over the plane of focus when widening aperture, while a new ratio of 2.25:1 can be found in the cropping menu. A torchlight has also been added to Focus' built-in camera mode, which should help when taking Portrait Mode photos in low light, and the app now supports Bluetooth for taking photos remotely. Lastly, a look at the general settings screen reveals an added ability to choose between JPEG, HEIC, and TIFF export formats, as well as a simple language selector, which now includes Persian. This app is flawless. Best way to edit Portrait Pictures. Is it better than the default camera app for portrait? Focos allows depth capture for portrait shots beyond Apple's 8-foot maximum range. Photos will simply be a non-portrait 2x shot if you try and take pictures like mine below with the stock camera app. This is the absolute game changer here. This is honestly the best app in years - here's some shots from the past couple months. Without a doubt the biggest step in mobile photography in the last decade. For sure. You can adjust just about anything in there. You can separate the background and edit saturation, hue, brightness etc and edit the front in a different way. You can set up lenses for various effects and tweak them as well. There's also way to select the exact point that the background is blurred (so you won't cut ears off or hair). Great great app. For taking the photo; up to you (although it lets you use the torch which makes low light shots better). The image on the left is stock from Apple. IPX 256 G version. The image on the right is from FOCOS. You have tremendous control on focus plane and adding in a better bokeh. You can scale the blur as much as you want. I really like this app. Great results. Like the article says, don't download unless your iPhone is a dual-camera version. It won't work with anything else. Also, any images taken with iOS 10 lack depth information. Only photos taken with iOS 11 will work. Just downloaded this, went through the options, and bought the full version. It’s ridiculously good. I love being amazed by apps; this one does just that. Bought the lifetime subscription within 30 seconds of using this app. It’s that good. Great app. Bought the lifetime license as well. Hate subscriptions. Needs Auto-Rotate, native iPad support (Universal application), maybe Apple Watch remote and—highly requested—a video mode! Tried it on iPhone X and iPad Pro. Sure you can't shoot portrait photos with iPad's camera but you can edit with Focos everything you find in the Portrait folder (when your library is synced with iCloud you'll have all portrait photos shot with iPhone inside). Editing with Focos on iPads is great (but it's only in x2-mode)! Did you know that Focos works with the iPhone X's front camera (even with "screen flash") as well? The dual-lens tech seems to be replaced with TrueDepth. But iPhone X only!